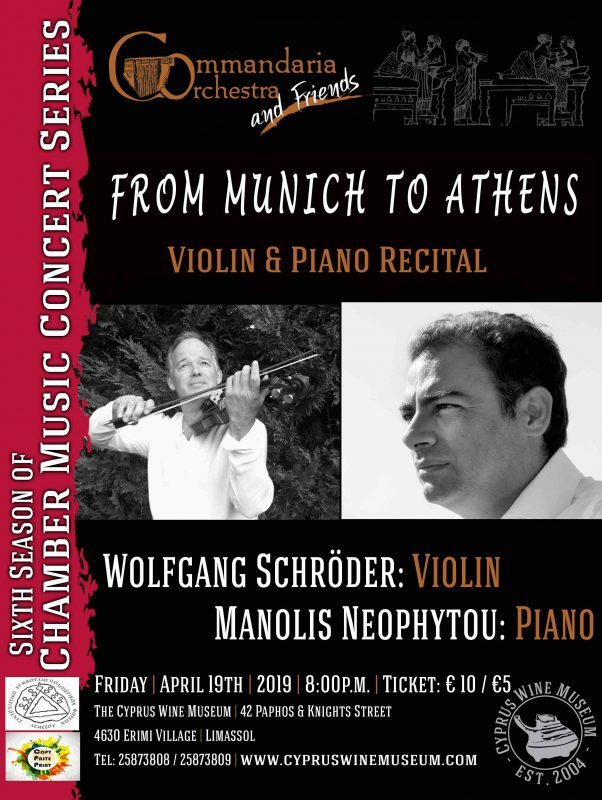 The Concertmaster of the Cyprus Symphony Orchestra Wolfgang Schröder (violin) and the talented pianist Manolis Neophytou meet on the stage after many years. Enjoy them in a high standard concert, with sonatas by R.Strauss, M.Theodorakis, Gershwin-Porgy, Bess Fantasy and others at the Sixth Season of “Commandaria Orchestra and Friends” Chamber Music Concert Series which takes place at The Cyprus Wine Museum. Wolfgang Schröder (violin): Born into a South German family, Wolfgang Schröders earliest studies began with his parents. At a young age Ana Chumachenko became his teacher and played a decisive role in his development as a violinist. At the early age of 17, he won the first prize at the German state competition Jugend musiziert (Youth makes music) and subsequently a scholarship at the International Menuhin Music Academy (IMMA). He has performed together with Yehudi Menuhin and Alberto Lysy, both as soloist and chamber musician in numerous European countries (Barbican Center, London), South America (Teatro Colon, Buenos Aires), and many other. After graduating from IMMA, he continued his studies at the Mozarteum University of Music in Salzburg under Prof. Sandor Vegh, and thereafter at the Mannes School of Music in New York under Prof. Aaron Rosand. Wolfgang Schröder’s solo career has included performances with the Bavarian Chamber Philharmonic, Munich Philharmonic, Stuttgart Philharmonic Orchestra, Czech Symphony Orchestra, Talich Chamber Orchestra, Polish Chamber Philharmonic, Kammerorchester Basel, Rubinstein Phil harmony Lodz, Salzburg Chamber Philharmonic, Camerata Salzburg, Nuremberg Symphony, Cairo Symphony Orchestra, Israel Soloists Ensemble, Athens State Orchestra, Thessaloniki State Orchestra, Thai Philharmonic Orchestra etc. He was also the artistic director of the European Community Chamber Orchestra (ECCO) from 1993-1995 and has performed a number of highly acclaimed concert tours worldwide. He has worked with conductors like Vladimir Ashkenazy, Andrey Boreyko, Daniel Raiskin, to name just a few. As an active chamber musician, in 1992 he founded the Belcanto String Trio and from 1996 to 2005 has regularly performed as violinist of the Trio Parnassus. In September 2001 the Trio Parnassus received the prestigious Echo Classic Award for their complete recording of the Schumann piano trios. As soloist and chamber player Wolfgang Schröder performs in musical centers such as the “Philharmonie” in Berlin, the Concertgebouw Amsterdam, the Vienna “Konzerthaus”, at the “Great Performers Series“ at Lincoln Center New York, at the “Frick Collection” Museum New York at the “Masters Series“ in London`s Wigmore Hall, at the London Barbican Hall, the Megaron Musikis of Athens and at “Teatro Colon” in Buenos Aires. Wolfgang Schröder’s chamber music partners include artists like among others Wenzel Fuchs, Vladimir Mendelssohn, Benjamin Schmid, Alex Karr, Cyprien Katsaris, Julian Rachlin, Janine Jansen, Daniel Raiskin, Ramon Jaffe, Andreas Frölich, Elisaveta Blumina, Levon Chilingirian Zvi Carmeli, Alex Hülshoff and Gustav Rivinius and Sennu Laine. He also has been regularly invited to major chamber music festivals such as the Kuhmo Chamber Music Festival in Finland, the Open Chamber Musicians Seminar at Prussia Cove (England), the Hopfgarten Festival (Austria), the Moritzburg Festival in Germany, the West Cork Festival in Ireland, the Umea and Bostad Festivals (Sweden), the International Music Festival Middelburg (Holland), the Euriade Festival in Aachen, Germany, the International Festival of Echternach (Luxemburg) and the Ojika Festival, Japan. Since 1998 he has been artistic director of the Camerata Stuttgart. Appearances with the Camerata Stuttgart include performances in prestigious concert halls like the Concertgebouw of Amsterdam, the Megaron Music Hall of Athens, Liederhalle of Stuttgart and the Dortmund Opera House. Wolfgang Schröder has made recordings for MDG, Divox, Ars Production, Thorofon, Symicon and CPO labels. A CD with the complete Sonatas for Violin by Eugene Ysaye appeared on Hook Records in 2017. Since 2005 he is 1st Concertmaster of the Cyprus Symphony Orchestra. Manolis Neophytou holds a Bachelor of Music (Honours) Degree in Performance from the Moscow State Tchaikovsky Conservatoire, where he studied with Prof. Irina Plotnikova and Prof. Arkadii Sevidov, with a scholarship from Nicolas Economou Foundation. He also studied in Ecole Normale in Paris with a scholarship from the Albert Russel Foundation. He has obtained his Masters in Piano Performance from the University of London with a scholarship from the State Scholarships Foundation of Greece (I.K.Y.). 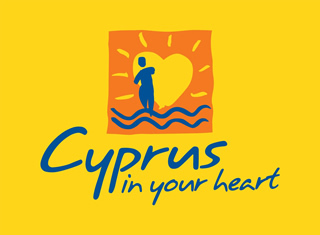 Manolis represented Cyprus at the Eurovision Classical Contests in Brussels (1992), Warsaw (1994) and Lisbon (1996) after winning the Cyprus National Competitions for young musicians. He has received prizes in several piano competitions: the Fourth Prize at Senegallia International Piano Competition (Italy, 1994), the First Prize at the Inter-Mediterranean Music Festival (Palermo, Italy, 1995) and the Second Prize at the Giorgos Thimis Piano Competition (Megaron Mousikis of Thessaloniki, Greece, 2002). 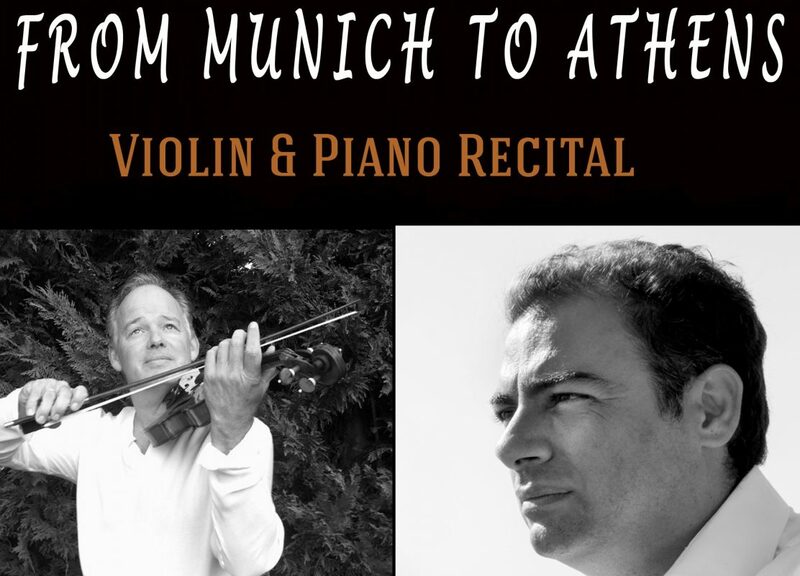 His performance activities include solo recitals and concerts in Greece, Russia, Poland, Italy, France, Ireland, U.K., Korea, South Africa and Cyprus. He is currently teaching piano at the Music Lyceum in Limassol, at the Arte Academy and European University of Cyprus. 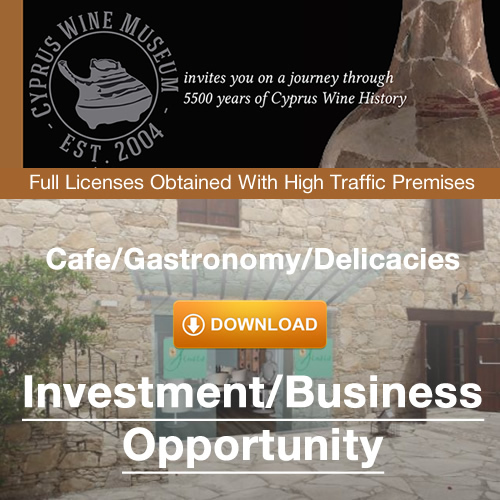 This entry was posted in Events at the Cyprus Wine Museum, News at the Cyprus Wine Museum and tagged Cyprus Museum, Cyprus Music, Cyprus Orchestra, Cyprus Symphony Orchestra, Cyprus Wine Museum, Limassol Concerts, Limassol Museum, Museum in Limassol, Wolfgang Schröder.